Whilst I longer harbour a desire to be a technology writer someday (though I’d need to be a lot more disciplined…and possibly a lot better at actual writing), if my career path in IT ever did come to an end, then I’d most likely want to fall into the world of food in some way. You see I’ve always enjoyed food – both the cooking of and almost certainly of the eating! Back in my younger days at school when I was undecided between a career in food or IT (before inevitably the IT took over and almost failed the course), I took ‘domestic science’ or ‘food technology’ or whatever the latest description of those classes are these days. It wasn’t a popular choice for boys – only three other males were in my class and whilst the first year went rather well and enjoyed the projects, by the time the second year had rolled around it was obvious that my passion was more towards the technology of the IT arena and I quickly lost interest in the year-long “bread” project that was the second year of my food course. I did eventually pass the course with a ‘D’ with absolutely zero effort and whilst my enjoyment of making food was to simmer for some time, it seems today that it will never quite disappear forever; there is a lot more interest left in me yet! Since moving into my own house over two years and living alone, many of my work colleagues have assumed that my life would be full of ‘take-aways’ and ‘eating out’, but that couldn’t be any further from the truth! I found that I was unlocked from the cooking of my parents and free to re-learn and re-kindle my passion for ingredients and producing food that was fresh, delicious and produced by my very own hands. It has been a bit of a re-learning curve – and there is still a long way left for me to go before I reach mastery of the food arts, but with so much inspiration on television in the form of Gordon Ramsay, Jamie Oliver and other celebrity chefs, in addition to fantastic programming like “The Great British Bake Off” that really do fire up those urges to start baking and making, how could one not! My cook book collection is growing – everything from Chinese food, Japanese, Jamie Oliver, Mary Berry and Paul Hollywood – and as the collection grows, so does my curiosity to challenge myself to try something new and delicious made entirely from scratch. It’s not always possible, of course, I mean who wants to cook from scratch after a long day in the office? But that’s what weekends are designed for; the time to be creative and try something new! 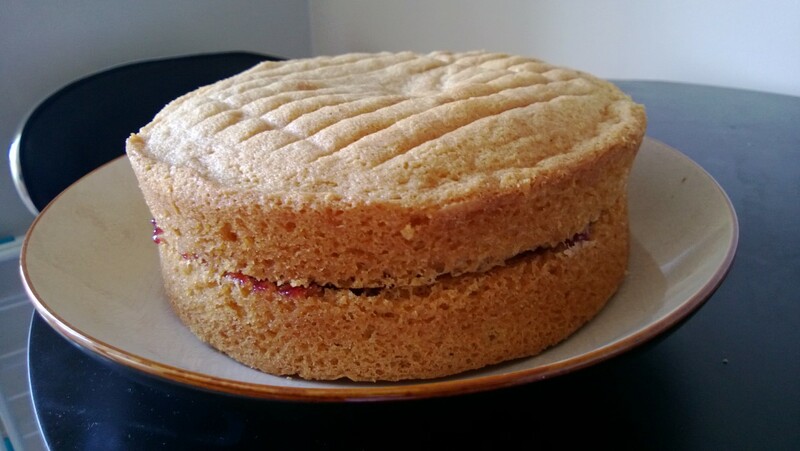 Today, for example, I’ve made a simple Victoria Sponge, inspired by a Mary Berry recipe, a pork Thai red curry with Paul Hollywood inspired homemade wraps….and that’s just Saturday – tomorrow, who know what I will challenge myself to produce? The only thing I can be sure of, is that I’ll enjoy every second of being in the kitchen and in couple of years’ time, who knows, maybe I’ll even re-think my career in computing and trade it all in?